A very common question people ask is, "When was my HP instrument made?" In the early years HP did not put any kind of date or date code on the instruments. The only clues to the date of manufacture are certain manufacturing styles that changed over the years. The color of the paint may also be a clue as HP used a variety of colors over the years. I will then use this information to compile a data base which I will post on this web site and refine as new data comes in. 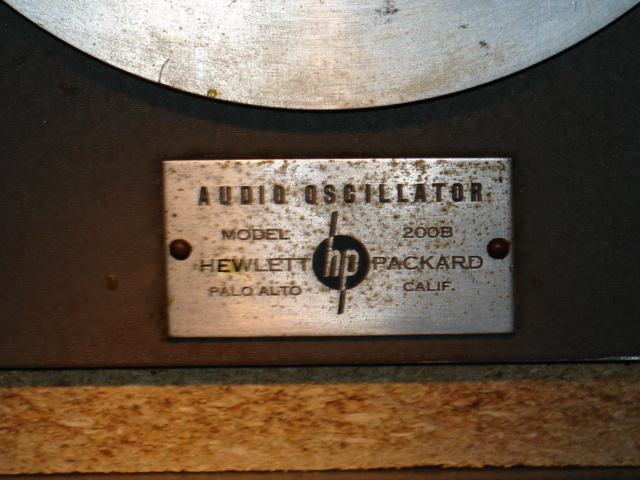 The main focus of this page is dating the vintage oscillators such as the HP200A, HP200B, HP200C, and HP200D. However, the information applies to other instruments too. 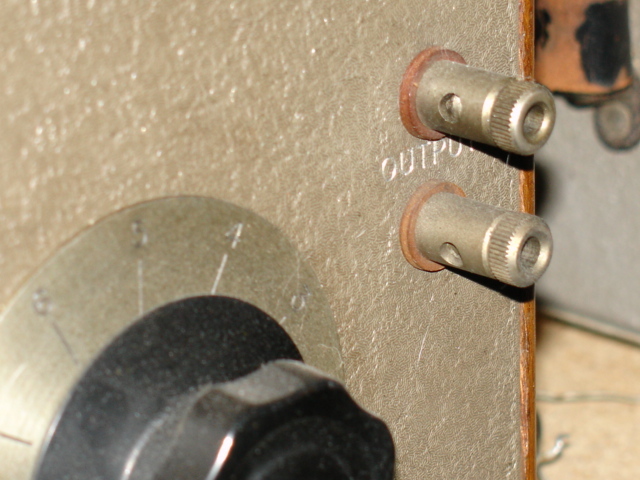 The early oscillators made between 1939 and circa 1941 could either have a rounded corner case or a rack-mount case. The rounded corner case from this period is noticably smaller (see http://www.hp.com/hpinfo/abouthp/histnfacts/timeline/hist_30s.html for a picture) than the larger rounded corner case in my collection (see below) and has the pilot lamp above the power switch rather than to the side but the larger rounded corner case may also have been used. The output binding posts would have been what I call the original style (I know of a possible older style but have not been able to confirm that). 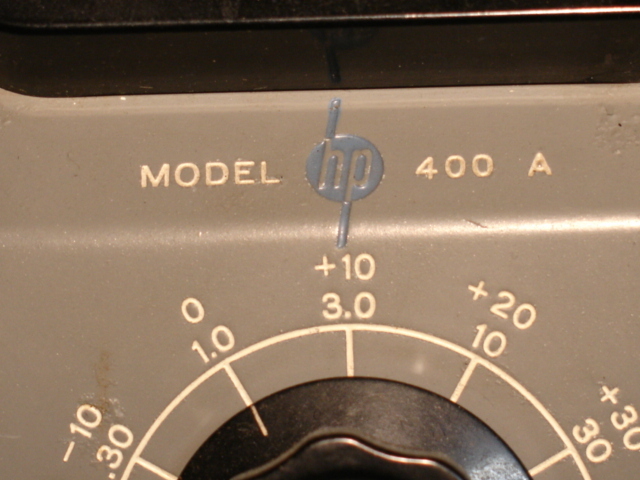 The name plate would typically have been metallic without an HP logo (see the drawing below for an example). The labeling on the panel would have been engraved without being filled with paint. The HP logo was introduced in 1941 so the presence of that logo indicates a unit made in 1941 or later. Pre 1941 units did not have a logo. There was only a name plate with Hewlett Packard on it -- see the example below. 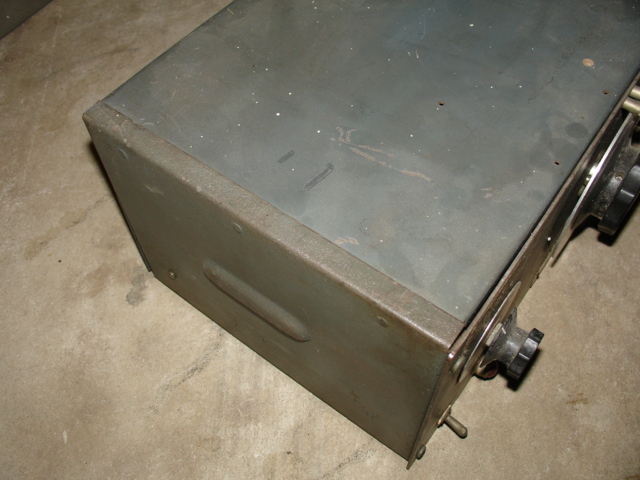 Oscillators made between circa 1941 and circa 1943 would have the old style rectangular case with corner brackets. 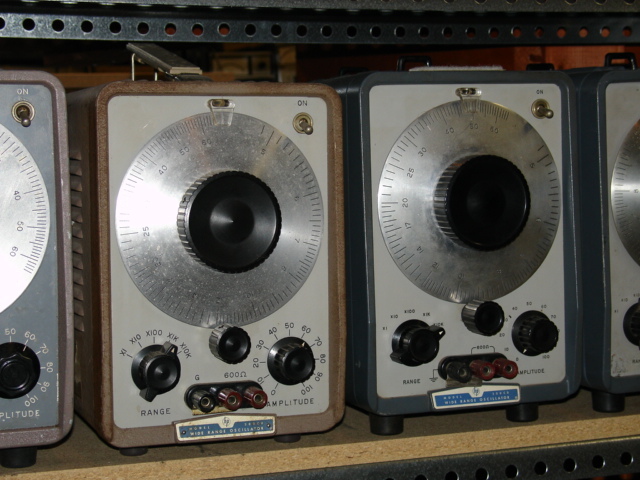 Some oscillators were made with the larger rounded corner case. The output binding posts would have been what I call the original style. 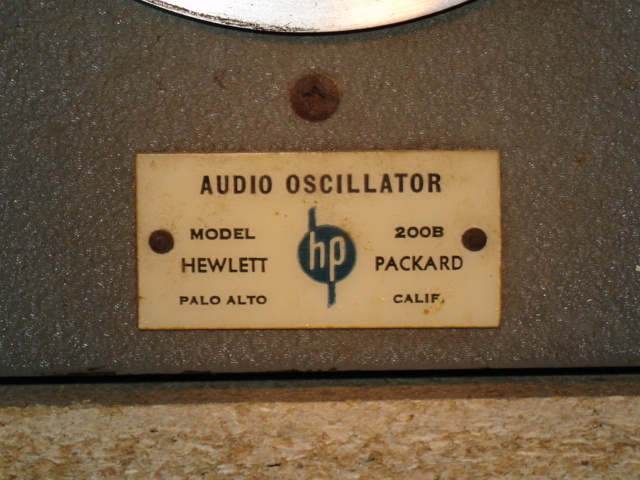 The name plate would have been either the metallic for oscillators made in 1941 (and possibly into 1942 but I doubt it -- more research is needed) or white non-metallic style (for oscillators made starting circa 1942 -- more research is needed) with the original style of HP logo. The labeling for the controls would have been printed on the round mounting plates. The labeling for early units (circa 1941) would have been engraved on the panel without being filled with paint. 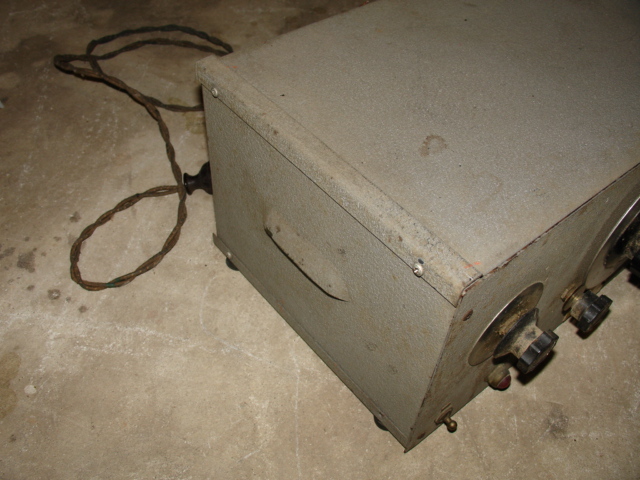 Oscillators made between circa 1943 and 1945 would have the old style rectangular case with corner brackets. I know of no examples of a rounded corner case from this or any later period. The output binding posts would have been the new #10 binding posts sold by HP. The name plate would typically have been the non-metallic style with the original style of HP logo. The labeling for the controls would have been printed on the round mounting plates. 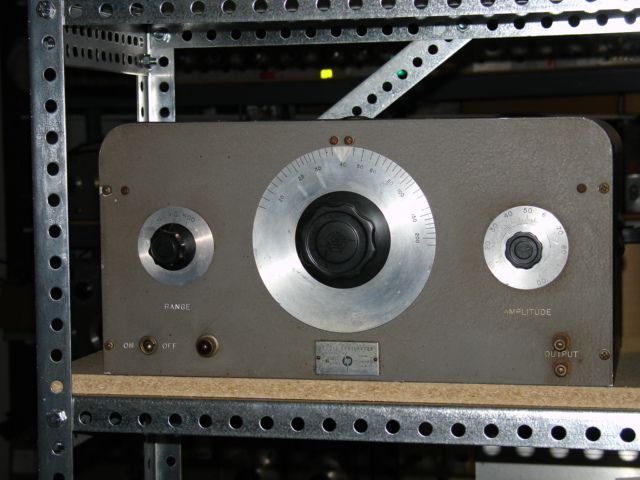 Oscillators made between 1946 and 1952 would have been the new style rectangular case with one-piece corners. The output binding posts were the #10 style. The name plate was metallic using the revised style of HP logo. The labeling for the controls was printed on the round mounting plates. Here are some crude serial number data I have been able to acquire. As best I can determine, serial numbers started with 1 and ran consecutively until the last unit. All of these oscillators were discontinued in 1952 and the last serial numbers shown below would be from that year ans also indicate how many units were made over the years. I will update this list as I obtain refinements. HP200B -- last serial number is roughly 46000, first serial number in 1942 is roughly 2450. The pictures below illustrate the various styles discussed above. 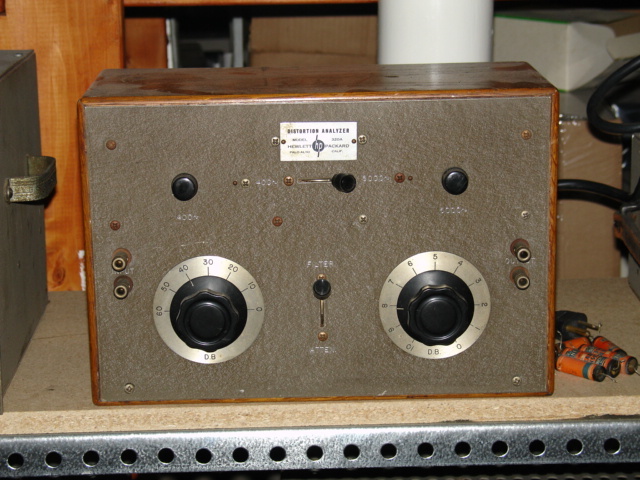 This is a pre-1941 HP200B unit owned by my friend, Glenn (http://www.hparchive.com). Note that the label does not have the HP logo on it. This unit has a serial number of 187 and is the oldest unit I know of. These are very rare. 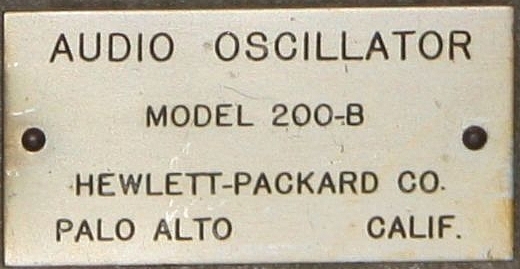 This is a close-up of the label of the above unit. This is an early HP200B with rounded corners. This unit has a serial number of 828 and is believed to have been built in 1941. Note that the panel is engraved without paint fill and it has a metallic model number label and uses the original style of output posts. A close-up of the label is shown below. 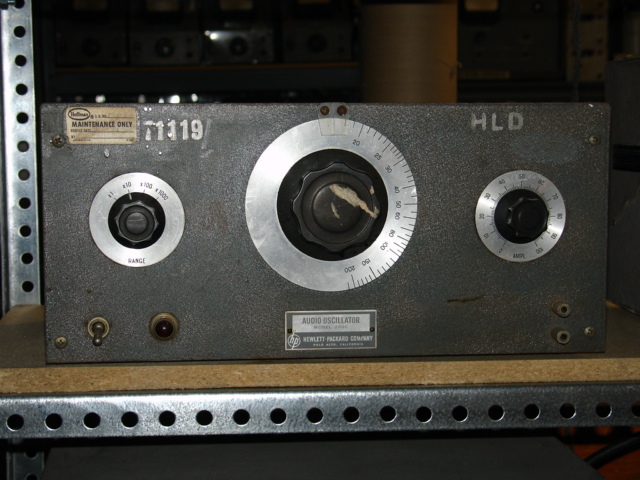 This is an early HP320A distortion analyzer with a non metallic model number label and engraved panel labels and the original style of input/output posts. It is believed to have been made in 1942. It also has a wooden box made of oak. Wooden cases were very common up to the early 1950s. The capacitors to the right were originally part of the unit but all had failed. I wanted to make the unit work so I replaced them with modern capacitors. 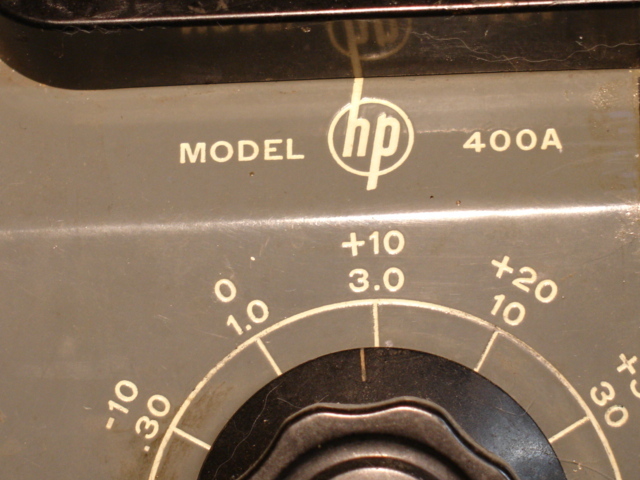 This is the first style of HP logo used on their instruments and was used between 1941 and 1945. The key feature to note is the contrasting extensions of the 'h' and 'p' outside of the circle. The contrasting extensions would be changed to non-contrasting in 1946 to simplify engraving. I have seen very few instruments with metallic labels like this one. It is believed that this metalic label was only used in 1941. Although this logo style was only used prior to 1946 (there are some exceptions -- see below) on equipment labels, the style was continued well into the 1950s on printed manuals. So when you see this style on a manual that does not mean the manual is pre-1946. A future web page will discuss dating of HP manuals. 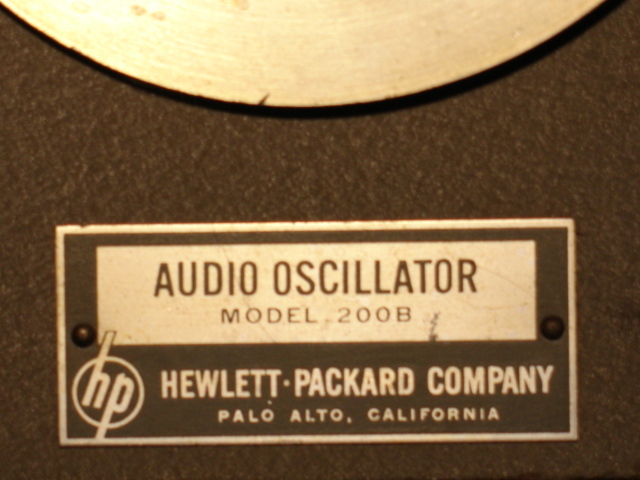 Here is another pre 1946 style of label on one of my oscillators with the contrasting extensions of the 'h' and 'p'. This is the non-metallic label. I believe its original color was white but most I see have yellowed to varying degrees. It is believed that this style of non-metallic label was introduced in late 1941 or early 1942. 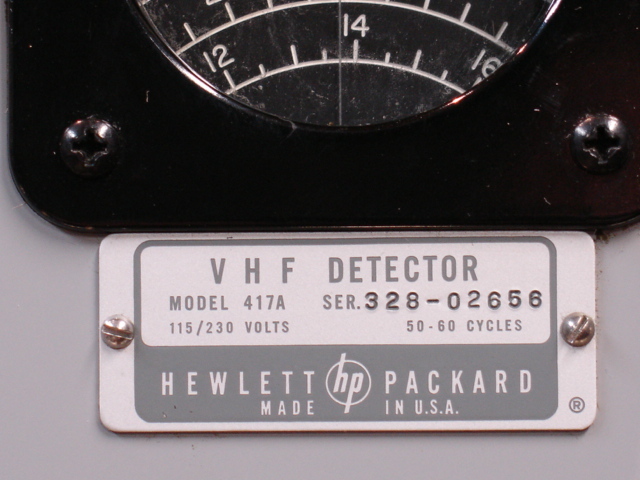 The history section of the HP web site shows a picture of an HP200C having a serial number of 12 with this identical label style. The unit would have been made prior to the first HP logo so something is inconsistent. The unit was cleaned up prior to being donated to HP and the belief is that the original label was lost and replaced with a label from a newer unit. This style of label was adopted in 1946. Note that the extensions of the 'h' and 'p' no longer contrast with the rest of the letters. This style was used with minor variations until 196x. This is an HP200C unit showing the control labeling on the round plates instead of engraved in the panel. The frequency knob is not labeled and I have only seen a FREQUENCY label on pre 1941 units. This is a very old instrument that uses what I refer to as the original binding posts. This style was used from 1939 to circa 1943 and was replaced by the #10 binding posts which first appeared in the 1945 catalog. Another indication that this is a very old instrument is the fact that the labeling was engraved in the panel and was not paint filled. This is an example of the #10 binding posts which I believe were introduced circa 1943. 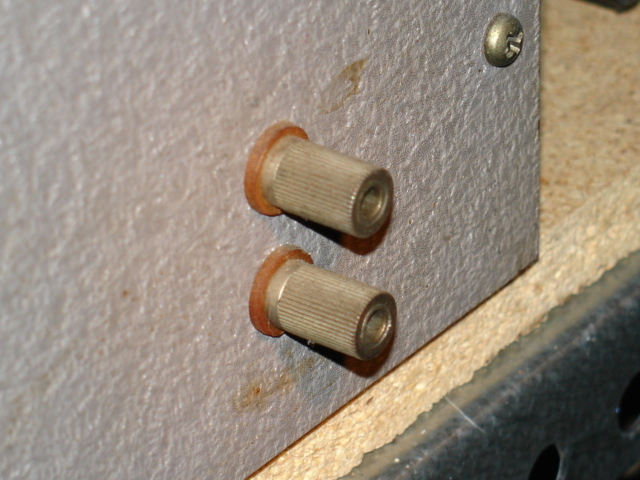 The knurled body nut could completely unscrew from the jack and these often became lost. Thus, it is not uncommon to see equipment from this period with the binding posts replaced by more modern plastic ones. Here is an example of the pre 1946 logo that was engraved and paint filled. However, this style is found on instruments known to be made after 1946. More research is needed. Here is another example of a pre-1946 logo engraved and paint filled. Here is a post 1946 label that is engraved and paint filled. Here is the name plate of an instrument made in the early 1960s. Note that it is very similar to the style introduced in 1946 but the text has a different font and is spaced for easier reading. 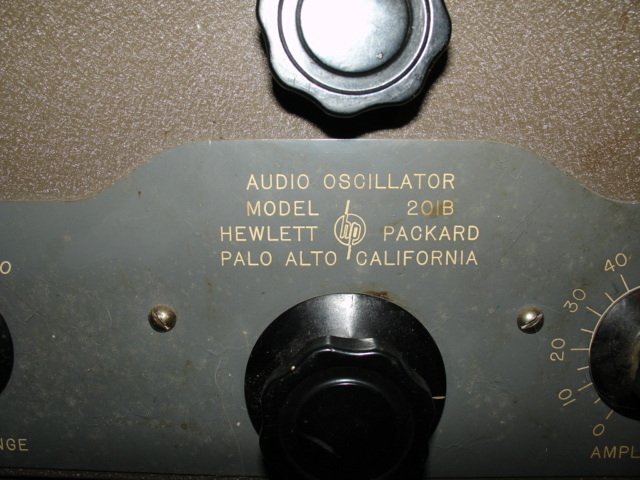 Note also that the original Palo Alto, California has been replaced by Made in U.S.A. as HP had plants in different places by this time. This is the old style rectangular enclosure used in the early 1940s and uses corner brackets. This is the newer style rectangular enclosure used after the mid 1940s and features one-piece corners. 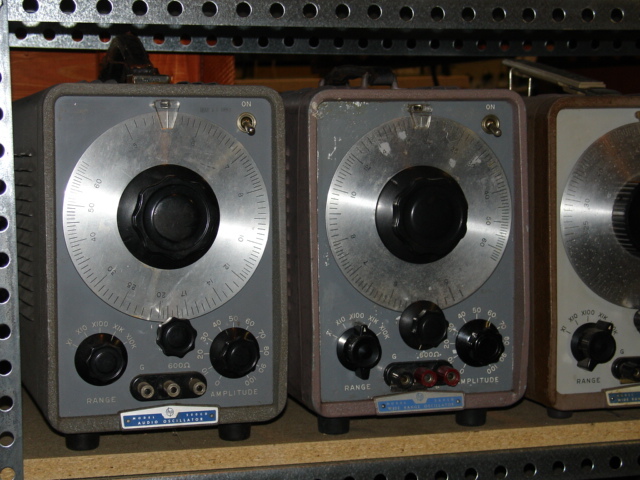 The following three pictures show six HP200CD units from different time periods in the production ranage between the years of 1952 and 1985. These are two old HP200CD units. The one on the left is has a serial number in the 200 range and most likely comes from the first production run. The first few thousand of these units used the #10A binding posts like on the early 200 series but now mounted on a plastic plate. 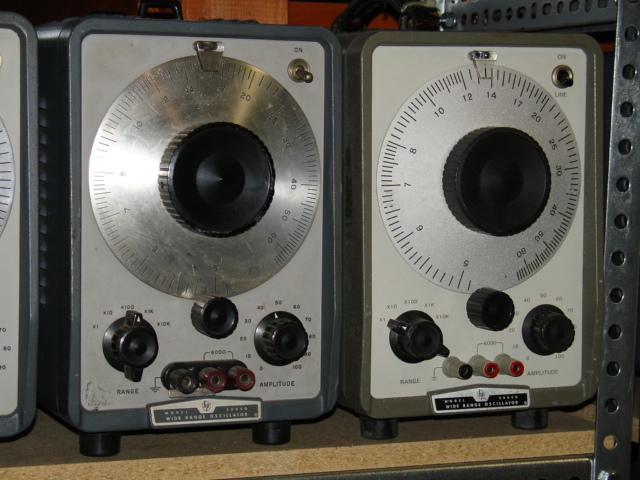 The unit on the right is believe to have been made around 1954. I saw this unit in pathetic shape at a hamfest and kind of felt sorry for it and bought it cheap. After a lot of effort and considerable clean up the unit now works like new. Note that this unit uses the new #10C and #10D binding posts. The HP200CD unit on the left is from the late 1960s. The unit on the right is the last version of the HP200CD and is believed to have been made in the late 1970s or maybe early 1980s.